Experts warn of long-term mental health consequences for thousands of asylum-seekers detained in Australia. "What we're witnessing in detention centres at the moment is an absolute crisis of despair, human misery and mental breakdown," Louise Newman, head of the Detention Health Advisory Group, an independent group advising the government on the health of asylum-seekers, told IRIN. Since the 1990s, the Australian government has had a policy of indefinite mandatory detention for asylum-seekers arriving by boat. "If you keep people in there, after a few months, they start to deteriorate mentally. By the time you get to 12 months, you've usually got very serious depression, trauma and its symptoms - and sometimes what we call psychosis, a very serious mental illness," Newman said. According to the government's own figures, over the past year there has been a significant increase in the number of people in detention for one year or more, with many detained for more than two years while their claims are being processed, activists say. Government statistics show more than 36 percent of detainees have been held in detention for more than a year. At least 20 percent of all detainees - many of them Sri Lankans, Afghans, and Iranians - now suffer from serious clinical disorders, while about 80 to 90 percent have mental disorders, including depression, anxiety and post-traumatic stress disorder (PTSD), Newman reported. 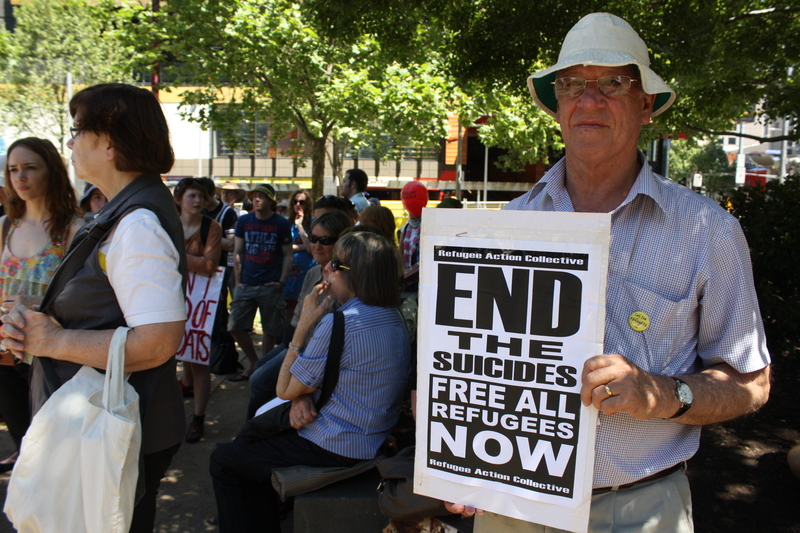 "There is conclusive evidence from much independent research and also the government's own commissioned research that the longer the people remain in detention, the worse their mental health," Michael Dudley, chair of Suicide Prevention Australia, agreed. "For these people, the situation is particularly dire." According to the Australian Department of Immigration and Citizenship (DIAC) , there are more than 4,000 people now in detention, including more than 3,000 people in eight high security immigration detention centres (IDCs) throughout the country. Many of these facilities are remote and difficult to access, far from outside scrutiny and with only limited access to mental health professionals. Many detainees, alone and without families, suffer from various forms of stress or anxiety while their refugee status is being processed, while many will ultimately require long-term treatment. "Long-term mandatory immigration detention can turn resilient characters into broken people who will need ongoing mental health support for their trauma," Paul Power, chief executive of the Australian Refugee Council confirmed. "I'm still treating people I met as children in Woomera and Baxter [detention centres] over 10 years ago, who are essentially disabled people, still suffering from traumatic symptoms related to their experience at the hands of the Australian government," Newman said. But it is the recent spate of suicides within the IDC system - six since September 2010 - that is most worrying, highlighting the extreme desperation many detainees - having fled torture and persecution in their own country - now feel. "I can't sleep. I can't think straight," one Tamil Sri Lankan detainee who has been held at the Villawood IDC in Sydney for more than two years, told IRIN, the slash marks on his arms still clearly visible. Like many detainees interviewed, he now relies on sleeping pills and anti-depressants to cope, but still suicide attempts continue. "I am reliably informed that there are two to three serious hanging attempts each day throughout the IDC system; many people are repeatedly, chronically self-harming," Dudley confirmed. So bad is the problem at the Christmas Island IDC that guards have been issued knives to cut down detainees who attempt to hang themselves. There is overwhelming research, including a 2010 study in the Medical Journal of Australia and an earlier British Journal of Psychiatry report, that the country's immigration detention system in its current form can and does result in psychological harm. According to one study, one-third of those detained for more than two years had new mental health problems, 10 times the rate of mental health problems for those detained for less than three months. But beyond the individual cost is the financial cost of mandatory detention that Australia itself will one day have to pay. According to the Yarra Institute of Religion and Social Policy in Melbourne, which examined the long-term health costs of extended mandatory detention of asylum-seekers, the costs for the country could prove substantial. Adverse experiences in extended detention could add some US$25,000 to the average lifetime health costs for each successful asylum-seeker, an October report by the institute revealed. In recent years, more than 80 percent of detained asylum-seekers have been recognized as genuine refugees and been settled in Australia. This means that whatever additional health costs are incurred by the individual will ultimately be picked up by the Australian taxpayer, the report said. "These people will eventually be released into our own communities damaged and traumatized," Ian Rintoul, spokesman for the Australian Refugee Action Coalition remarked. "And in the end, we as a society will have to bear the cost."